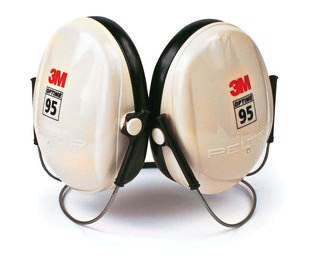 Peltor Optime 95 (also sold as H6B/V) Neckband Ear Muffs fit behind the head instead of having a traditional headband. These ear muffs are designed to be worn comfortably with a wide range of hats and helmets. This keeps your hearing protection from interfering with other safety equipment, including helmets and protective eyewear. With foam-filled ear cushions, this low-profile ear muff is ultra light weight and ideal for children through small adults.